Truly superb and extremely rare Liberty & Co "Athelstan" quartersawn oak wardrobe, designed by their one time Design Director, Leonard Wyburd. 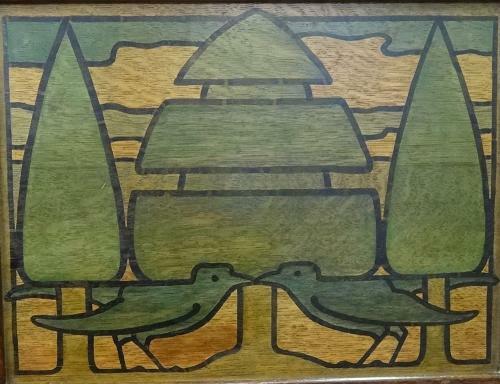 The coloured stencilled central panel of stylised birds and trees very much in the manner of CFA Voysey; c1900. Approx 6ft high overall, 3ft wide and 20" overall depth including handle, otherwise 18" depth exc handle.